Admittedly ‘perfect’ is a pretty subjective word but we really made Patrick work hard on this recipe. Every week lots of us down at the Fresh Farm grab an upcoming recipe and give it a proper road test at home. If we don’t like it we’ll tell our head chef what we think and he’ll adjust until it’s just right. We think he hit the nail on the head with this one and we hope you think so too! Pre-heat your oven to 200 degrees and boil a large pot of water. Peel your apples, discard the skin and cut the apple from its core. Dice the apple up very finely. Lastly, cut the bottom centimetre from your tenderstem broccoli and discard these leftover dry ends. Cook your apples in a small non-stick pan on medium-low heat with 1 tsp of butter, 5 tbsp of water, ½ tsp of cinnamon, 1 tsp of sugar (if you have some) and a pinch of salt for 20 mins. Put a lid on and stir, add a dash of water occasionally if you need to. 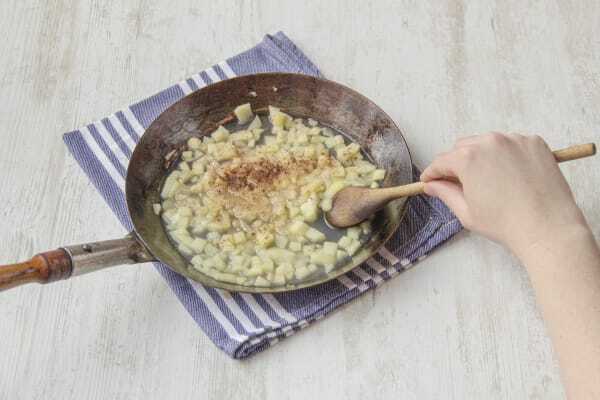 Cook your potatoes in the boiling water with ¼ tsp of salt for around 15 mins, or until you can easily slip a knife through them. 3 mins before they are done we’ll add in the broccoli, but don’t worry as we’ll remind you about that later. 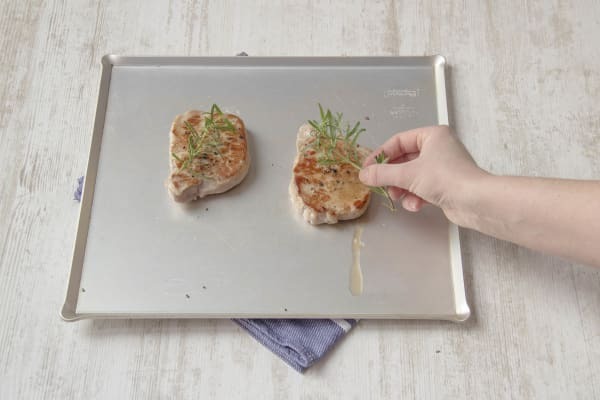 Transfer the chops to a baking tray and scatter a few rosemary sprigs across the top. Keep a sprig for your potatoes. Cook in the oven on the middle shelf for 12 mins, which should make them nice and juicy inside. Remove them from the oven and rest them for a few mins. Here’s that reminder: 3 mins before the potatoes are done, put your broccoli into the water. Once 3 mins are up, you can drain both the potatoes and the broccoli, then separate. 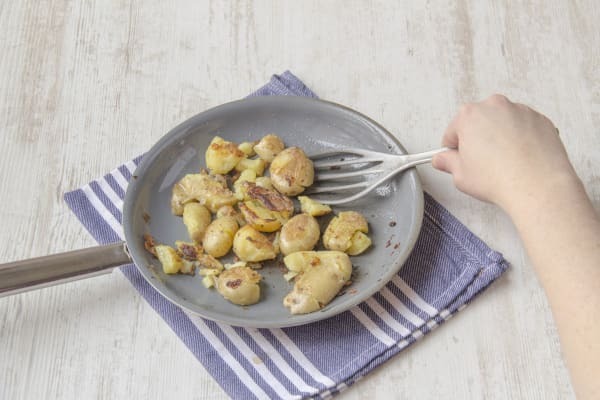 LH: Crush your potatoes ever so slightly using the back of a fork. Fry these off in a non-stick pan on high heat with 1 tbsp of olive oil and a tsp of rosemary leaves. Once the potatoes have crisped up around the edges, they are ready. 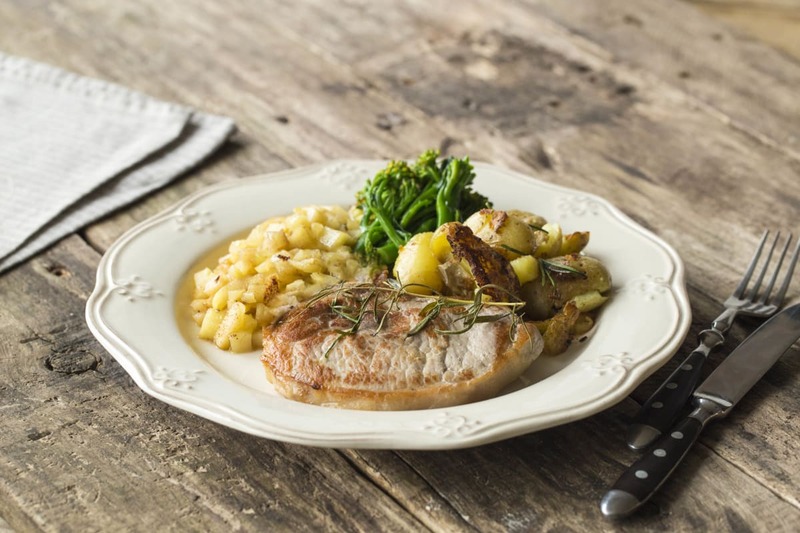 Serve with a big smile and a bigger appetite.